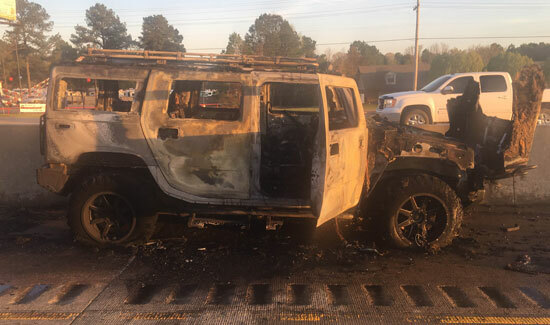 Bryant Police officers received a call yesterday around 6:30 p.m., regarding a reckless driver in a white Hummer westbound on I-30 in Bryant. Officer Mark Kling heard the call and immediately tried to locate the suspect as more calls were coming in regarding this driver. As Officer Kling continued on I-30, he spotted the Hummer just before Congo overpass in Benton. 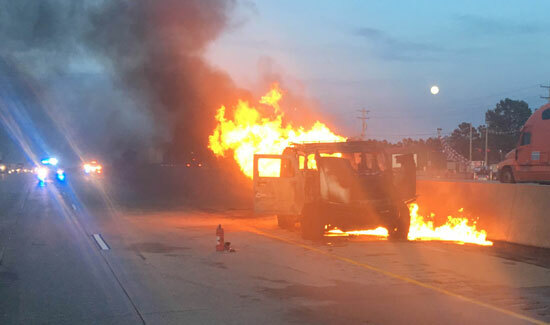 He noticed that the vehicle had hit the inside wall and it had smoke coming out from the cab and appeared to be on fire. As Officer Kling reached the Hummer, he noticed that the driver was still in the car and was just sitting there and not responding to him. He said he didn’t appear to be unconscious, just staring straight ahead. Both doors were locked so Officer Kling used his ASP baton to bust the passenger window so he could get the door open. The smoke was getting thick at this time and it was all he or anyone else could do to breathe while trying to save the driver from his burning vehicle. Others had also stopped and tried to help the driver, but the smoke was too thick. About that time, Officer Jason New arrived on scene and he started trying to assist in the rescue. While Officer New climbed on the hood of a burning vehicle with attempts to kick in the front windshield, Officer Kling made his way to the driver’s side door, which was pinned up against the concrete wall, and started trying to bust the window. After several attempts, he was finally able to bust through. The driver at that moment regained his senses and started trying to crawl towards the passenger side of the vehicle. Officer Kling then ran back to that side and with the help of Officer New, they were able to pull the driver safely from the burning car. It was later learned that the driver, Bilal Al-Amin, was driving while under the influence. The incident was turned over to the Arkansas State Police for investigation. 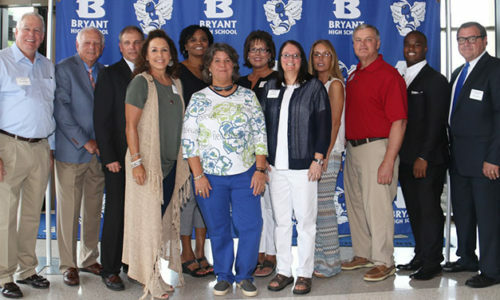 The Bryant Police Department would like to recognize our two officers for their heroic measures by risking their own lives to save this man from his burning vehicle. Each day when an officer puts on that uniform, they never know what they may encounter, but with each day, every officer knows that when that time comes, they will be ready to answer that call and put their own lives at risk, in order to save that one person. It’s good to know that we have good men and women like Officer Kling and Officer New out there protecting and serving the citizens and keeping each and every one of safe. The Bryant Police would also like to thank the two citizens that were also out there trying to help rescue this man. Their courage did not go unnoticed in this situation. We are not sure of their names but would like for them to come forward so they can be recognized as well.